Dubai boasts many great hotels that offer wonderful banquet facilities, making it difficult for couples to select a hotel suitable for their wedding. Couples are spoilt for choice in Dubai; there are endless wedding venues to select from: The small and intimate indoor event spaces at restaurants, clubs or hotels; outdoor venues overlooking the turquoise waters of the Persian Gulf or iconic buildings like Burj Khalifa, or huge magnificent ballrooms at opulent hotels like Atlantis The Palm, you name it and Dubai has it. Here, we have selected for you 3 hotels in Dubai that are close in distance to Dubai International Airport and which offer great ballrooms that are popular in Dubai for weddings and other celebrations. 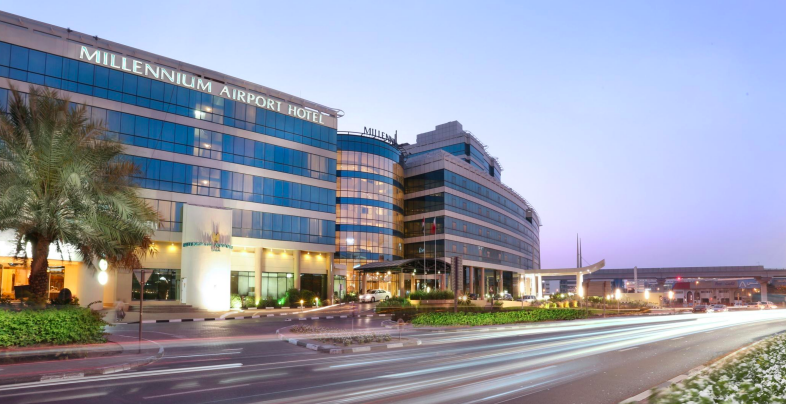 Le Méridien Dubai Hotel & Conference Centre is within a 2 minute's drive from Dubai International Airport. Sophisticated, refined and inviting, Le Méridien Dubai is a hidden haven that enjoys an idyllic verdant setting in a city location. 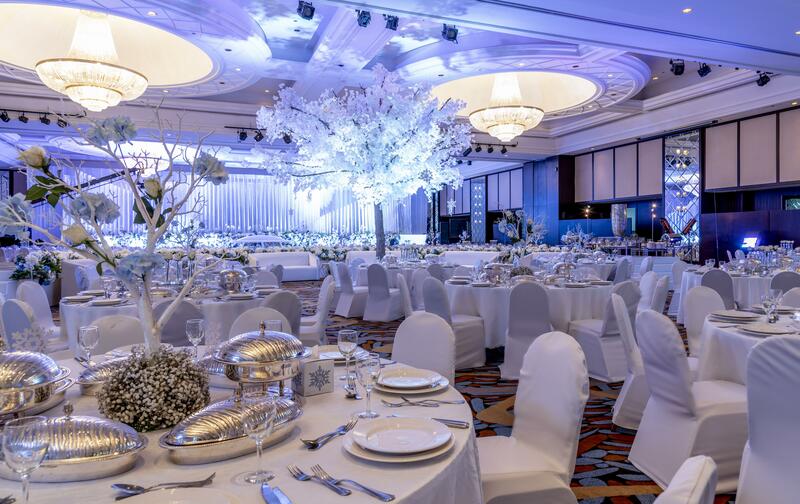 This Dubai airport hotel offers an exceptional 5 star hotel accommodation option providing the ultimate in contemporary comfort and one of the largest wedding ballrooms in Dubai. 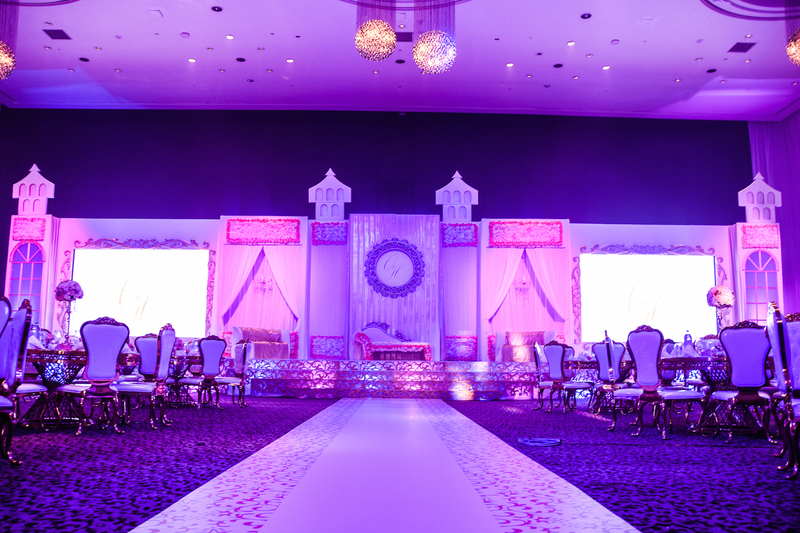 Its 5,500 square-meter banquet and conference facility is equipped to accommodate the most demanding event. The Great Ballroom, 1,515 square meters, can accommodate up to 1,300 wedding guests seated (in banquet style). The hotel's Events Hub will plan every detail of your wedding, from the wedding cake to the elegant decorations. The attentive and efficient Events Hub team brings together the ideas that make every detail flawless and delivers a memorable experience. With 18 food and beverage outlets ranging from a sports lounge and an Irish Pub to authentic fine-dine restaurants, Le Meridien Dubai Hotel and Conference Centre offers the complete package for all culinary needs. Roda Al Bustan Hotel enjoys a location close enough to Dubai International Airport to arrive in minutes. The business and commercial districts of Deira with their famous gold and spice souks or Bur Dubai and Festival City can be reached within 10 minutes and the leisure and shopping attractions of Downtown Dubai are also a fifteen- minute drive. Whether you are planning an intimate event or a much larger celebration of families and friends Roda AL Bustan has many event spaces to suit every occasion. 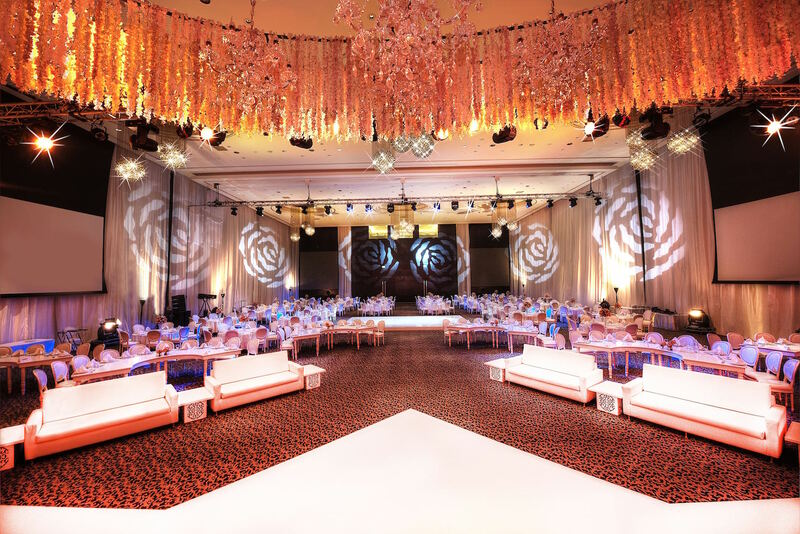 The Grand Rashidiya Ballroom boasts its own private entrance and elegant pre-function areas along with a VIP majilis. For receptions, luncheons or dinners there is a range of other elegant event spaces at Roda Al Bustan. Millennium Airport Hotel is conveniently located near Dubai International Airport, just five minutes drive away from terminals 1 and 3. Its close proximity to Dubai's major central business district, historical sites, tourist spots, shopping centers and entertainment hubs make it a preferred choice of stay for many. The Hotel offers a distinctive choice of restaurants and bars, Al Garhoud ballroom, 5 meeting rooms and 2 boardrooms with high end facilities and a range of leisure options including a superb large outdoors swimming pool and a fully equipped fitness center. The newly opened 600 square meter Al Garhoud Ballroom at the Millennium Airport Hotel seats 430 wedding guests in banquet style, and 550 guests for a cocktail reception.